Last season, I only attended one road game for the Syracuse Crunch during the Calder Cup playoffs. This season I have already traveled to two road games. Road games are fun, exciting and very different when you are there with the visiting team. The fans are behind their team and make the visiting team very aware of that fact. Photography wise, the arenas are different and I have to learn the best places to photograph the games with help from the home team’s photographer(s). The lighting may or may not be as good as the Onondaga County War Memorial which put in NHL caliber lighting before the start of last season. In that, I have been spoiled. I have also become friends with a veteran AHL photographer who has helped me tremendously in getting my feet wet (or frozen) covering Crunch road games. He set me up for the first road game in the Broome County Memorial Arena in Binghamton, New York as the Crunch took on the Binghamton Senators. Broome County had installed the same lighting over this past summer as the Crunch did so I was a happy photographer. The Senators had soundly defeated the Crunch the night before in Syracuse by the score of 6 to 2. I was not sure what kind of response the team would have just 24 hours later. I am happy to report, they responded brilliantly. The Crunch played their most complete game of the young season and pulled away in the third period with three goals to win, 4-1. 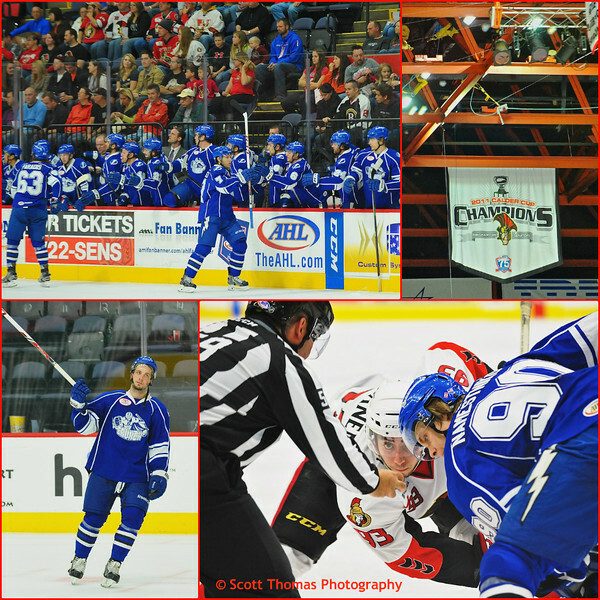 Photos from the October 19, 2013 game between the Syracuse Crunch and Binghamton Senators in the Broome County Memorial Arena in Binghamton, New York. From upper left, the crowd is very quiet as Syracuse Crunch defensemen Artem Sergeev celebrates his goal with teammates on the bench, Binghamton Senators’ 2011 Calder Cup Championship banner hanging in the rafters, Vladislav Namestnikov (90) and Binghamton Senators Mika Zibanejad (93) facing off and Nikita Kucherov (86) is greeted by empty seats after being named First Star of the game. Took me a bit to get used the silence after a Crunch goal. Then, again, that is what it sounds like when the visiting team scores in the War Memorial, too. The second road game was to the new Utica Comets who joined the AHL this season after the city’s 20 year absence from the league. This time their parent club is the Vancouver Canucks and the Comets were sporting the Canucks’ aqua green and blue colors. The Comets name has a long history with hockey in the Mohawk Valley region of New York state. Including the Clinton Comets who were a member of the old Eastern Hockey League (EHL) and played many games against the Syracuse Blazers. The EHL was the league the movie, Slap Shot, was loosely patterned after. This was the first time since 1977, Syracuse and Utica professional hockey teams have played each other. Management from each team hope these games will garner lots of fan interest. If the first game in Utica is any indication, they will get their wish as the Utica Memorial Auditorium was filled almost to capacity with over 3,900 fans. Many had traveled from Syracuse with it being the closest AHL arena on the schedule. The lighting in Utica was a good 1 to 1.5 stops slower and I had to adjust my exposure settings accordingly. My shutter speed was in the 1/500 to 1/800 range. Not ideal for the speed of hockey and many of my photos were not sharp. I hope the Comets can install better lighting in the future. It will increase both fan and player enjoyment of their games. 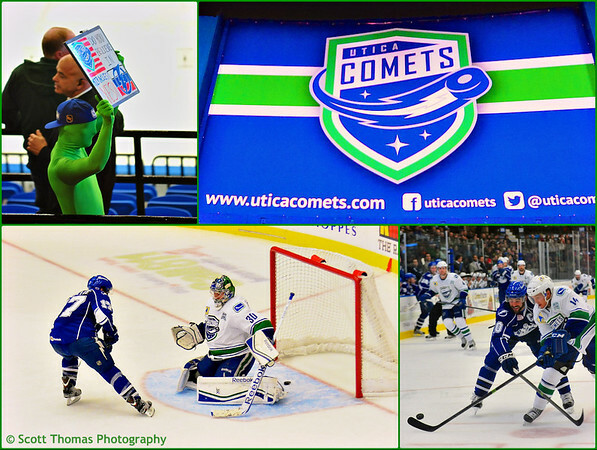 Photos from the October 26, 2013 game between the Syracuse Crunch and Utica Comets in the Utica Memorial Auditorium in Utica, New York. From top left, Utica cloned the famous Vancouver Canucks Green Men, the logo for the Utica Comets on display, Syracuse Crunch captain Mike Angelidis (10) fights for a loose puck with Utica Comets Patrick Mullen (14) and Crunch Cedric Paquette (17) puts in the shootout winning goal past Comets goaltender Joacim Eriksson (30). The game was a bit sloppy for the first two periods as the teams skated to a 1-1 tie. Syracuse dominated the third period out shooting the Comets 16 to 5 while Comets goaltender Joacim Eriksson was basically standing on his head keeping the puck out of the net. The game came down to a shootout where Eriksson was beaten on a “dangle shot” by the Crunch’s rookie forward Cedric Paquette. A fun ending (for Syracuse anyway) to a highly competitive game. I will be attending more road games this season for sure. This entry was posted in Sports, Weekly View and tagged 70-200mm, ahl, american hockey league, away, binghamton, comets, games, ice hockey, new york, nikon D700, nikon D7100, road, senators, utica, vr. Bookmark the permalink.